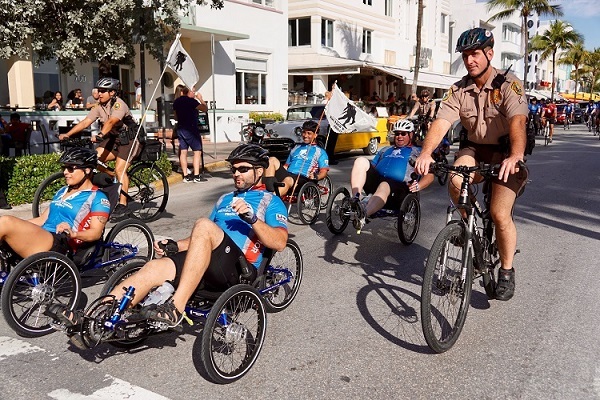 MIAMI & KEY WEST, Fla. (Jan. 16, 2017) – A group of injured veterans served by Wounded Warrior Project® (WWP) recently rode 56 miles during Soldier Ride® in Miami and Key West. Throughout the four-day gathering, warriors discovered Soldier Ride is more than a cycling event – it is a chance to heal their bodies and minds through experiences that connect them to their fellow service members. Army veteran Natalie Charles said the chance to have fun with other like-minded veterans helped her form connections that are free of judgments. For many, Soldier Ride is the first time during their healing process that they venture out of their homes to connect with the community. Many wounded veterans face similar challenges with isolation when transitioning to civilian life, and gatherings like this offer a chance to bond with other warriors and learn they are not alone. The bicycle ride wasn’t the only thing planned for the injured veterans; they also enjoyed a trip to Jungle Island, a zoological park, to participate in a dolphin swim. More than two dozen veterans participated in the swim, including Army veteran Kim DeFiori, who found a way to connect with the marine mammals in a way she didn’t think she could. In a WWP survey of the injured warriors it serves, more than half of survey respondents (51.7 percent) talked with fellow Operation Enduring Freedom, Operation Iraqi Freedom, or Operation New Dawn veterans to address their mental health issues, and 29.6 percent expressed physical activity helps. Programs like this highlight the importance of managing mental health through physical activity and connecting with other veterans. It’s something that is especially true for Air Force veteran Sebastiana Lopez Arellano, who was badly injured in a motorcycle accident after she returned from overseas. Soldier Ride gave her a chance to do what she loves – exercise and stay healthy. Before every Soldier Ride, each warrior is fitted with adaptive equipment to accommodate injuries and make the ride as comfortable as possible. To find photos from this event in the Newsroom, click on multimedia, then images.